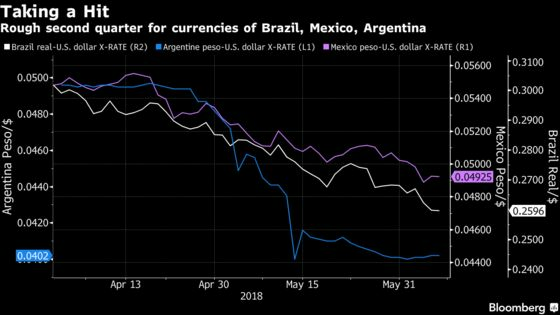 (Bloomberg) -- Emerging markets struggling with higher U.S. interest rates are likely to get little sympathy from the Federal Reserve. Currencies of such nations have been hammered in a spreading selloff amid worries that their economies won’t cope with higher U.S. borrowing costs. That’s prompted central bankers in India and Indonesia to raise interest rates and urge Fed caution, with Turkey on Thursday also delivering a surprise hike to defend the lira. There are few signs such concerns will steer the Fed away from its course for at least two and possibly three more rate increases this year, including a move at its policy meeting next week. Chairman Jerome Powell explicitly pushed back against criticism early last month in Zurich, saying the role of U.S. monetary policy on foreign domestic financial conditions was “often exaggerated.” His colleague, Governor Lael Brainard, mentioned emerging markets in a May 31 speech, but spent far more time discussing the upside risks posed by fiscal stimulus. The U.S. economy is powering ahead, adding over a million jobs in the first five months of 2018. Inflation is at the central bank’s 2 percent target, and the Atlanta Fed’s gross domestic product tracking model suggests the economy grew a strong 4.5 percent in the second quarter. Even if exports are tempered by foreign economic woes, trade fights, and a somewhat stronger dollar, some $1.5 trillion in fiscal stimulus and a $300 billion increase in federal spending are supporting domestic U.S. demand with “a huge tailwind,” said Torsten Slok, chief international economist at Deutsche Bank AG in New York. The Fed is tasked with achieving stable prices and full employment. At 3.8 percent in May, unemployment is already well below estimates of full employment and recent forecasts show officials expect a modest overshoot of their 2 percent inflation target. Meanwhile, the Fed’s benchmark lending rate is still low enough to stimulate growth, according to some measures, leaving officials with little choice but to keep raising it to a level that is more neutral in its impact on supply and demand. U.S. policy makers have also gone out of their way to communicate the plan for gradual rate increases and a shrinking balance sheet to avoid repeating the 2013 taper tantrum, when then-Fed Chairman Ben Bernanke surprised investors by suggesting the central bank might slow bond purchases. Delaying policy tightening could also carry costs for emerging markets if it led to higher inflation that forced the Fed to act more aggressively, said Nathan Sheets, chief economist for PGIM Fixed Income. There have been occasions in the past when the Fed has paused in response to international developments. In 1998, for example, then-Chairman Alan Greenspan led the committee to cut rates three times to offset effects of spreading financial turmoil. The bubble in technology stocks eventually burst at high cost to the U.S. economy. In 2016, Fed officials set aside plans to raise rates four times over the year in reaction to financial-market turmoil triggered by concern over slowing Chinese growth. They hiked just once, but could also point to U.S. inflation that was running too low as a reason for their caution. The Fed’s preferred gauge of price pressures averaged just 1.2 percent that year, while it hit 2 percent on a 12-month basis in both March and April 2018.